Here are 40 handbag storage solutions that every woman wants to look at. Big and small handbags, formal purses and beach bags, made of fabric and leather needs to be stored to preserve their good looks. 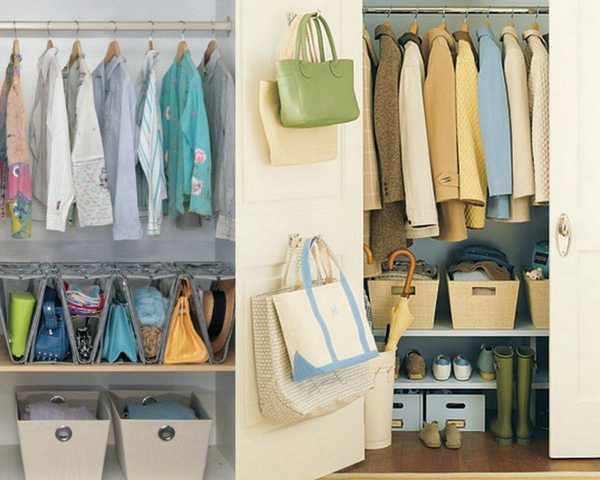 Creative storage ideas and space organizers offer many options for handbag storage, allow you to save space, quickly find and choose the right handbag or purse and give your closet and entryway neat and organized appearance. Proper storage organization is a way to keep these accessories look like new. Sort your handbags and purses by season, fabric and sizes. Store in different places accessories that you rarely use and your casual handbags that you often use. If you are a happy owner of a large collection of handbags it is a good idea to sort them by color and design also, so it is easier to find the handbag you need and remember where similar bags are. Storing a handbag for a relatively long period requires taking care of its material and shape. Filling it with crumpled paper and avoiding hanging on a hook, folding a handbag or stacking handbags and purses on top of each other keep these beautiful accessories looking attractive for years. Storage organizers, baskets and boxes are convenient and space saving storage solutions that add organization and aesthetic appeal to closets and shelves. Home organizers that are hung in the closet or doors, baskets and boxes on shelves allow to use tags and preserve handbags and purses good look. Baskets and boxes, covered with fabric, protect handbags and purses from dust and UV damage, help preserve their shapes and colors, and are wonderful storage ideas for valuable dressing accessories. Baskets and boxes are ideal storage solutions for small collections of handbags or roomy closets. If you have a limited space for storage, and have lots of handbags in different sizes, you can consider other storage solutions, like decorative hooks, storage racks and closet rods with rings for your casual handbags. 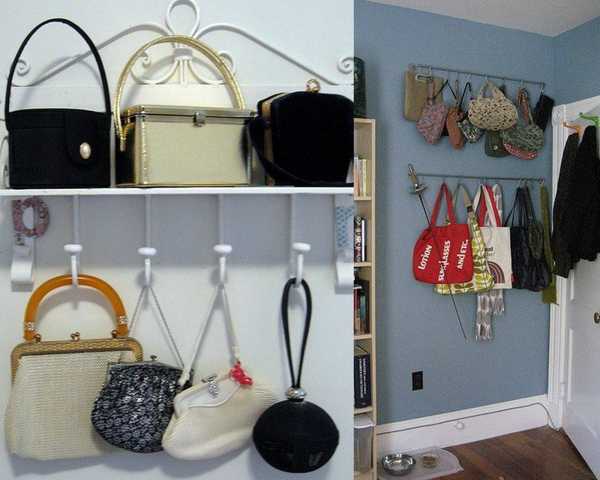 Decorating doors and walls with attractive hooks for handbags and purses is a great storage idea for small apartments and homes. Doors and wall space in the entryway, hall, bedroom, closet and even living room can be transformed into an original work of art with colorful handbags and purses in various colors. Storage racks for clothes, hats and keys can be used to store your casual everyday handbags also. 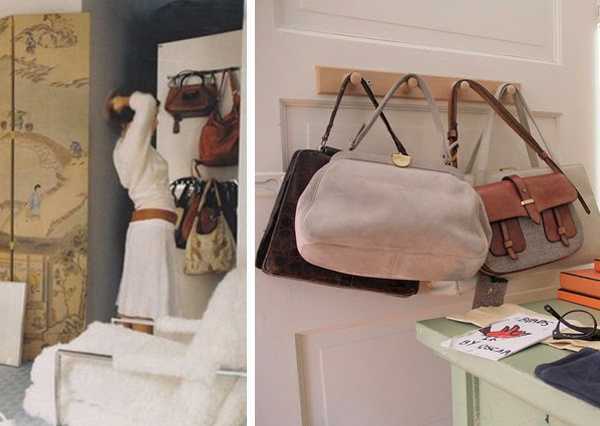 Any shelf can be used to store handbags and purses. Arranging the accessories in a row on a shelf, or in home organizers is a way to protect handbags and purses from dust and light damage, and keep them looking attractive and new. In a small apartment without a dressing room or a closet chests, wardrobes, storage cabinets and bedside tables are good alternatives for handbag and purses storage. Organized on shelves and in drawers and well protected in storage furniture, handbags and purses save you time when you need to find the right dressing accessory.